This is how to savor the Big Apple – one tasty bite at a time on the NOLITA NYC Food Tour. 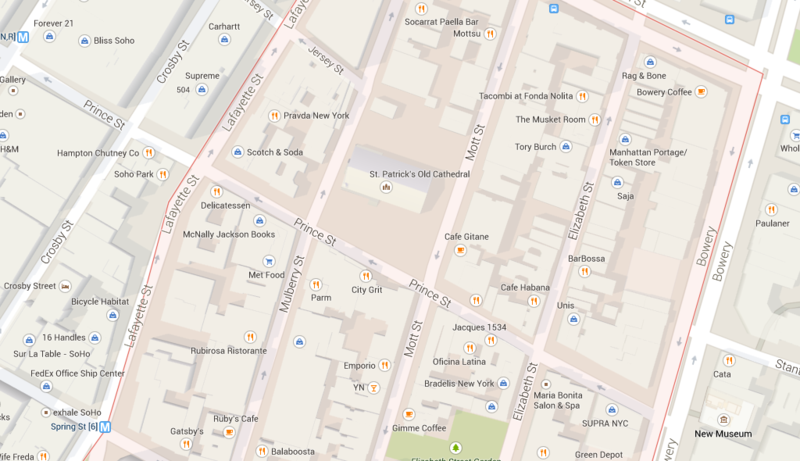 It’s an enjoyable 2-hour guided tasting tour through tiny Nolita (North of Little Italy). A bustling, on-the-move neighborhood blending Old World charm and a trendy vibe, it’s one of Manhattan’s gems. Along its narrow streets, early to mid-20th century low-scale red brick walk-ups coexist seamlessly with sleek, low-rise undulating charcoal brick, glass and steel buildings, most upscale condos. Street-level space in the older buildings holds neighborhood groceries; small restaurants in tucked away places, serving Italian, Vietnamese, Thai, French, Mediterranean, Chinese, Israeli, Mexican, Turkish food prepared the old way; and kitschy shops selling jewelry, trinkets and clothing. Nolita’s edgy boutiques, upscale designer stores, and trendy new restaurants fit right into the ground level floors of minimalist buildings. Nolita has a diversity of ethnic influences, but the flavor of Italy prevails. As the large late 19th century immigrant enclave of Little Italy, deeply rooted in the culture of Naples and Sicily, began shrinking with the realization of the American dream, a growing Chinatown expanded up from the south, filling the void. This press of cultures, past and present, created Nolita, giving it a wonderful ambiance, all of which is experienced along the walking tour. Savoring the taste explosion of each bite is the fun part! Of course, Italian flavors are the neighborhood’s heritage: real, fresh, smooth handmade mozzarella with the perfect accompaniment; Italian specialty cheeses, salamis, olives, breads, olive oil. Super-tasty Vietnamese Banh Mi sandwiches, a baguette deliciously layered to create multiple flavor sensations: pork, Asian seasoning, garlic, mayo, cilantro, fresh cucumbers, or multiple combinations of other yummy favorites. Cuban yucca fries, like French fries with more flavor; Spanish tapas, small plates of amazing flavor; quiche the French way, dense with flavor, yet fluffy and light. Then there are the sweets: freshly baked pastries – some flaky, others densely packed with tasty morsels; handmade candies in multiple flavors; and, of course, New York-style cheesecake.